In order to lead you need followers. You can lead by fear or inspire people to follow you and trust you. Keeping people motivated and engaged in times of change is very difficult. People are concerned for their livelihood and job. Leaders must be able to create a culture that fosters trust, commitment and a sense of pride. 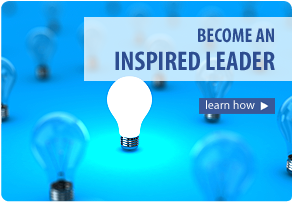 If you think of great leaders, they were able to communicate a vision and inspire people to follow them in their journey. So the question are leaders born or trained comes to mind. Ironically, we all know what leadership is, but we can’t agree on a definition, and the thousands of books on leadership prove it. Successful leaders are all different but similar in one way, they are emotionally intelligent. Other research shows that 30% of a company’s performance is traced to the company’s culture, and up to 70% of it can be defined as how emotionally intelligent the workforce is. 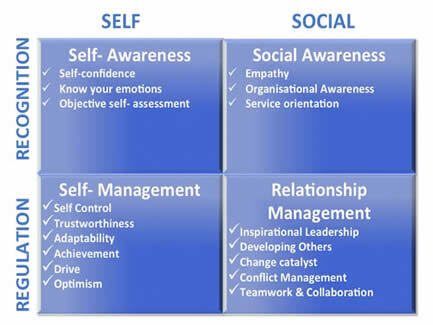 Emotional Intelligence is the ability to recognise, understand and manage emotions of self and others. When you have high emotional intelligence you can recognise your own emotional state and the emotional states of others. You can use the understanding of emotions to relate better, manage better and achieve greater success. Self- awareness The ability to recognise and name your own emotions, and how they affect your thoughts and behaviours. It helps you understand objectively and accept your strengths and weaknesses. As a result you have more self-confidence. Self- management The ability to control impulsive feelings and behaviours, demonstrate and manage your emotions in healthy ways and take initiative and follow through in commitments. Social- awareness The ability to understand others point of view, their emotions, concerns, and needs, and show empathy. Relationship Management The ability of using the social awareness to build and maintain good relationships, to communicate clearly, inspire and influence others, and manage conflict effectively. Research shows Emotional Intelligence is twice as important as IQ in predicting outstanding performance, and EQ can be developed until well into our 40's, regardless if we are born as a leader or not, we can improve our leadership by improving our EQ. Our Emotional Intelligence Training and Coaching is specifically designed to develop and expand EQ, as a route to achieving these performance benefits. At Inspiring Potential we employ coaches and trainers who have experienced the sharp end of corporate life first hand and are qualified in NLP and EQ-I, an Emotional Intelligence assessment. We are therefore well equipped to understand the issues and contexts that executives may be faced with. . We can improve the EQ of your leaders and managers through our tailored Emotional Intelligence Training and Emotional Intelligence Coaching programmes.